She was on the verge of winning the 1993 Wimbledon Championship, up 6-7, 6-1, 4-1, and 40-30 in the third set, a point away from taking a commanding 5-1 lead over Steffi Graf. Jana Novotna then double faulted, and proceeded to melt down. Ten minutes later, Graf had won the final set 7-6 and taken her fifth Wimbledon championship. Novotna, who let glory slip through her fingers, could do nothing but cry on the shoulder of the Duchess of Kent, as the tennis world cried with her. The tennis world cried again, as three-time Olympic medalist Jana Novotna died on November 19, 2017. She was only 49, succumbing to cancer. Novotna’s career was hardly shattered by her dramatic loss in London in 1993. Encouraged by the Duchess of Kent, she came back five years later to win the 1998 Wimbledon singles championship. But when I review her grand slam tennis record, I was amazed at how many championships she won in doubles and mixed doubles: 4 doubles and mixed doubles championships at the Australian Open, 5 doubles championships at the French Open, 5 doubles and mixed doubles championships at Wimbledon, and 4 doubles and mixed doubles championships at the US Open. In other words, Novotna had a total of 17 grand clam championships, although 16 were in doubles. I thought, wow, that’s a lot of grand slam championships….until I saw the list of tennis players who had more grand slam titles. There were 20 people ahead of her. What I found interesting is that of the 20 people ahead of her, most had decent balance between singles and doubles championships – people like Margaret Court, the all team leader at 64, with 24 singles championships and 40 doubles championships, or Serena Williams with 23 singles and 16 doubles championships. There were a few like Graf and Chris Evert who basically focused on winning singles championships. But the majority on the list piled up their championships in the doubles arena, like Novotna. Is there a difference in mentality and skill sets for singles players vs doubles players? According to this blog post from the website Talk Tennis at Tennis Warehouse, there are significant differences between the two. doubles guy can’t seem to get to the net because singles guy’s pinning ’em to the baseline — so who’s gonna win? When Emil Zátopek, the Czech distance runner gave away one of his gold medals, he still had three other gold medals and a silver. Australian distance runner, Ron Clarke, a perennial gold-medalist-to-be, had to settle for a gold medal gifted to him, albeit from arguably the greatest distance runner ever. Zátopek was not one for airs, and may have given all of his medals away if asked. But most Olympians would never part from their hard-won treasure. And yet, when Olympians win medals at the Paris Olympics, they may have that opportunity. The Paris Olympic Organizing Committee asked designer, Philippe Starck, to create the medals. Starck, who also designed the relay torch for the 1992 Albertville Winter Games, developed a medal that can be shared, literally. As you can see in the photos and the video, the medal is thicker than the traditional Olympic medal as three sections can be removed from it, each section a medal in its own right. Presumably, the Olympian can keep the entire medal as is, or give the sections away, presumably to family members, strong supporters, sponsors, or close friends. The New York Times recently noted that this could be the way that coaches are finally recognized for their contributions to a victorious Olympian’s achievements as they do not receive medals. So at the Paris Olympics, most likely in the summer of 2024, Olympians can share their triumph in a way that is truly unique. The International Olympic Committee announced on Monday, July 31, 2017, that Los Angeles, California will be the host to the 2028 Summer Olympics. They are also the second city to be awarded the Olympics three times. London, which last hosted in 2012, also held the Olympics in 1908 and 1948. When Paris is given the official nod for 2020, the City of Lights will be the third city with the right to host three Olympiads. The announcement on Monday was no surprise as the IOC has been quite public about its attempt to get Paris and LA to agree to hosting either 2024 and 2028. This allows the IOC to skip a (potentially painful) selection cycle that would have started in 2021. This deal buys the IOC time to persuade candidate cities in the future that the Olympics doesn’t have to be such a tremendous burden on the host nation. What’s interesting about Los Angeles is that in all three cases – 1932, 1984, 2028 – they won the bid without competition. Paris insisted on 2024, and explained that the land reserved for the new Olympic Village would not be available if they had to wait for 2028. LA would have 2028 if they wanted it. 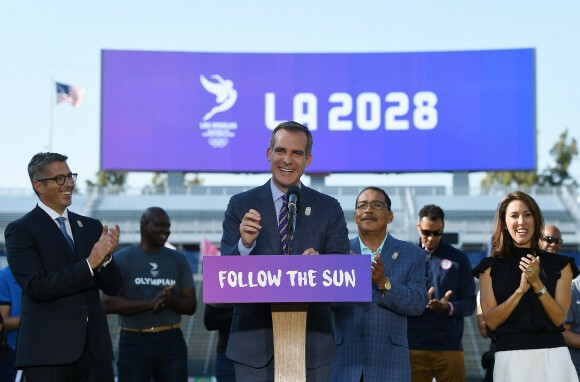 The IOC sweetened the pot financially, and LA willingly sunk their hands in it. In 1978, two years removed from the financial debacle that was the Montreal Olympics, and only six years after the terror of the Munich Olympics, only two cities were in the hunt for 1984 – LA and Tehran. 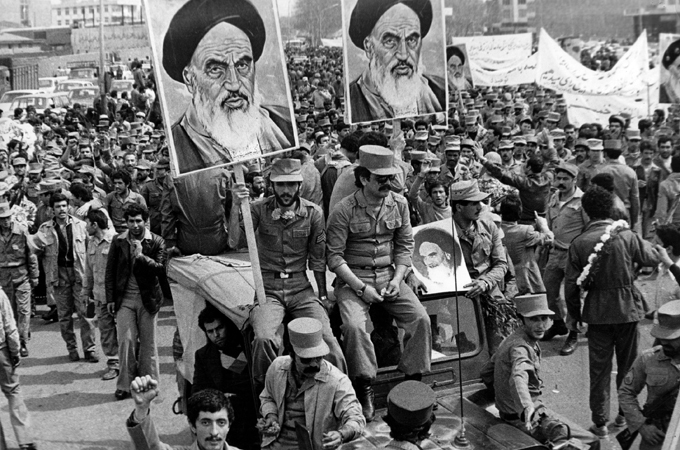 Tehran was likely feeling the rumbles of the Iranian Revolution, which exploded a year later, so pulled out of its bid, leaving Los Angeles as the only choice. An excited whisper runs like a flash across the stadium. 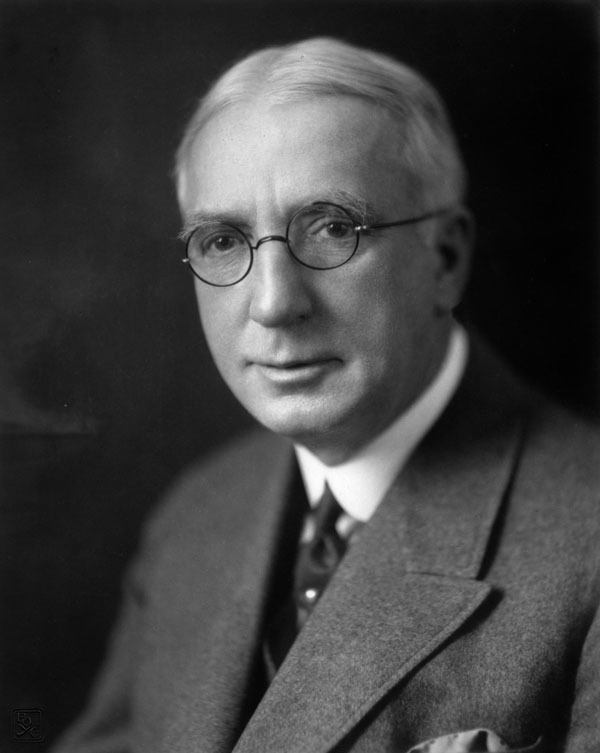 A voice that fills every corner of the vast bowl breaks forth from the huge electoral announcer. The Vic-President arrives at his box and for the first time is clearly identified to the audience. He waves his hand to acknowledge a renewed outburst of cheers. His gesture brings a hush to the babble of noises. The time-table on the daily programme is hastily consulted. What comes next? Despite the growing fears of the Olympics as financial albatross, and thus the diminishing number of cities interested in hosting an Olympics, interest in the 2032 Summer Games is, strangely enough, popping. As explained in post 1, India is investing in a study to determine the feasibility of hosting the Summer Olympics after Paris and Los Angeles. Perhaps more surprising, after the citizens of Hamburg voted against the bid in a referendum in November, 2015, 13 cities in an area called North Rhine-Westphalia in Germany have already put forth a preliminary plan to host the 2032 Summer Olympics and Paralympics. By expanding the number of locales, and thus the number of ready-to-go sports venues, costs can be kept reasonably low, which is certainly in line with what both IOC and local populations expect. Germany’s option would lessen the risk that the IOC fears, but the widespread plan is poised to damage the overall athletes and Games experience that is core draw of the Olympic Movement. There are no details in the plans that describe the Olympic Village, but with over one-hour travel time between Düsseldorf and many venues, transportation and the use of a single Olympic Village could be a concern. One thousand and ninety six more days to the commencement of the 2020 Tokyo Olympics! That’s 365 X 3 + 1. Don’t forget, 2020 is a leap year! Three years hence from today, July 24, Tokyo will be welcoming the world to the biggest sports fest there is – The Summer Olympics. The first country to ever host both the Summer Olympics and the Paralympics twice, Japan will be the focal point for sports from July 24 to August 9, 2020. In 1964, Tokyo hosted the Olympics from October 10 to 24, for a total of 16 days, which was standard in the 1960s and 1970s. However, since Barcelona, the opening ceremonies was pushed one day earlier from Saturday to Friday, likely allowing for two full weekends of sporting events, and an opportunity to maximize television viewership. Another difference between 1964 and 2020 is the timing. 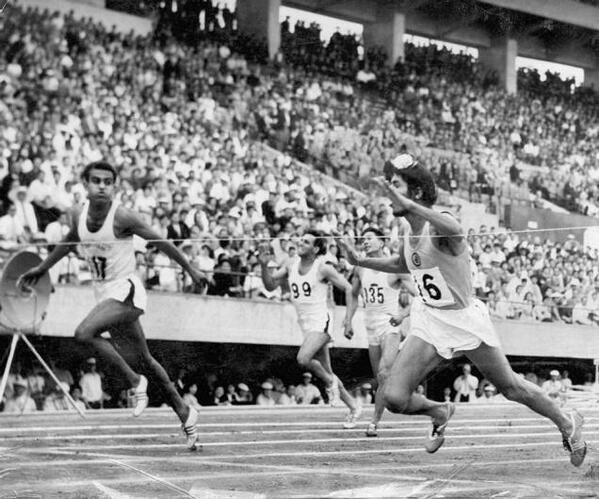 In 1964, the “Summer” Olympics were held in the Fall to avoid September monsoons. But this time, the Olympics will be held in the hottest period in Japan – late July and early August. This has been the general timing for the past eleven Summer Olympics, excluding a September Sydney Games and Seoul Games. My guess is that the various international federations want consistency in Olympic scheduling so that their own world championships and Olympic trials do not end up in conflict. That would be the same for many school systems that go on holiday break during the summer months. And television broadcasters may also prefer to have the Olympics to fill what are usually filled with summer repeats. One thing is certain. The Summer Olympics are coming to Tokyo on July 24, 2020. And just in case you need to know, click here for the countdown to Tokyo 2020.